As expected, the Gilas Pilipinas Basketball Team triumphed in Kuala Lumpur. 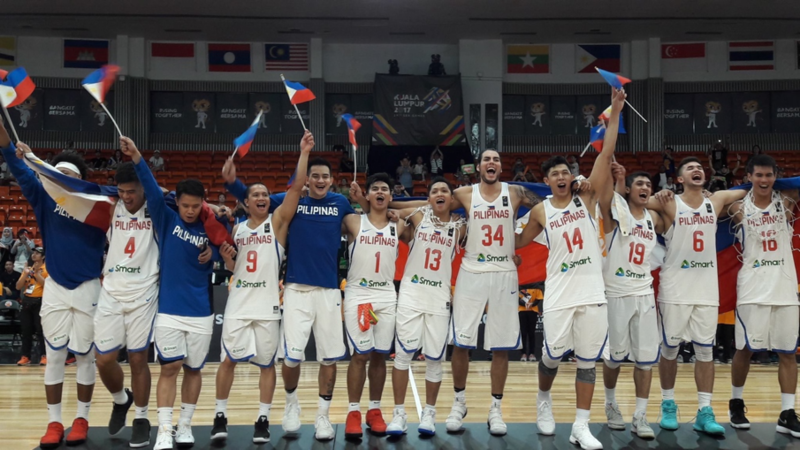 This was the 18th Gold Medal for the Philippines in the South East Asian Games and even as the pressure mounts, Gilas Pilipinas continues to deliver. The journey to the gold was not without its challenges. First was the schedule conflict with the FIBA Asia Cup which gave the SBP the challenge of forming two national teams that would have to train alongside each other. Moreover, two of the Gilas players for the SEA Games would be coming directly from the FIBA Asia Cup in Lebanon. Given the limited time of practice together, and with some Gilas players unable to leave their mother ball clubs in the PBA, these factors posed a serious threat to the Gilas campaign. Another challenge was how the other countries were sending their best, veteran-laden teams with naturalized players for the SEA Games. Some teams went as far as not sending their “A” team to the SEABA while others held training camps in Europe to prepare to take down the Philippines in the SEA Games. Once the tournament started, Gilas Pilipinas faced their toughest challenge. They immediately ran into a veteran Thai team which overhauled an early deficit to take the lead at a crucial stretch of the game. Led by their naturalized player Tyler Lamb, ABL stalwart Kannut Samerjai and the first half explosion of Chitchai Ananti, Thailand overhauled the deficit to turn the game into a nip-and-tuck affair. Gilas though, would turn to their defense to regain control of the game. Bobby Ray Parks gave Tyler Lamb all he could handle while also fishing for Lamb’s fifth and disqualifying foul. On the offensive end, Baser Amer and Kiefer Ravena made clutch baskets to seal the deal for the Filipinos and allow them to start their campaign on a positive note. The Thailand game was followed by two blowout wins done in contrasting fashions. The Myanmar game was won very early as Gilas started out with a 15-0 run which they steadily turned into a 90-point lead. The Malaysia game was won 98-66 but not after tense moments owed to the games physicality where two Gilas players – Baser Amer and Carl Bryan Cruz—were curiously ejected from the game. The hosts were intent in creating a rough and tough atmosphere and try to maximize their home court advantage. The physicality seemed to energize Gilas as they elevated their intensity and level of play as things got tougher. Just as everybody though that Gilas hit its peak after the tough win over Thailand and the blowouts against Myanmar and host Malaysia, the semi-final match-up against Singapore did not go as expected. The subpar shooting of Gilas failed to add on to the 15-point third quarter lead. Instead, Singapore would creep up to as close as 7 before the Gilas would wrest control of the game. Gilas won 68-60. For the final, Gilas saved their best game for last beating Indonesia 94-55. Behind the hot-shooting Mike Tolomia (20 points, 5/8 3FGs) and ample support from Kobe Paras (14 points, 6/6 FGs), Gilas was never threatened en route to its 18th Gold Medal in the SEA Games. It was a meeting of the two unbeaten teams in the tournament. Coming into the game, people expected a showdown of sorts as Indonesia was fresh form their US and Europe training camps with the sole focus of dethroning the Philippines for the SEA Games Gold. After topping Group B and beating Thailand, the team that posed the biggest challenge to Gilas, Indonesia must have felt that their time for SEA Games glory had come. Gilas, however, had other plans. Their 19-15 lead after the first quarter was suddenly 45-27 at the halftime break. This did not bode well for the hopeful Indons as Gilas continued their dominance in the second half. As questions on the Filipino dominance arose, the Gilas Cadets appeared to emphatically erase any doubts on who were the kings of the South East Asian hard court.